This project examined the use of asynchronous text-based consults within the clinical practice. 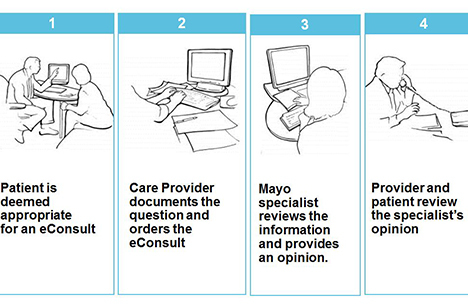 Along with the Mayo Clinic Center for Innovation (CFI), the eConsults team piloted a formalized communications approach between providers when a complex question or an opinion from a specialist is needed, but a face-to-face examination of the patient is not. The effort was to expand the triage options of care, corresponding to the correct level of service required. During the pilot, the team found that eConsults allow for non-visit collaboration between providers, reducing inconsistency. The format also opened up staff time to see patients who benefit the most from face-to-face expertise. eConsults shortened visit duration and gave patients the care they needed faster. As eConsults took about one-third of the time of face-to-face appointments, care providers’ schedules could be organized and scheduled consistently. Since the approach eliminated the necessity of additional visits, in most cases eConsults significantly benefited non-local patients by reducing the need for a return trip to Mayo Clinic. Importantly, the approach enabled referring care providers continued care management control, a major benefit for Mayo Clinic Care Network members. 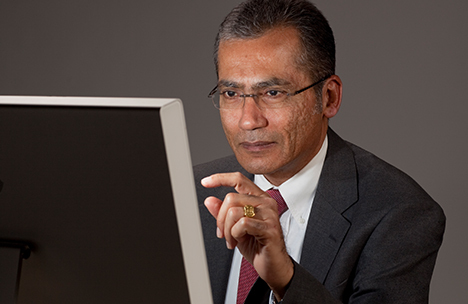 eConsults was implemented enterprise wide through the Center for Connected Care at Mayo Clinic.